This month I have decided to join Fat Mum Slim's photo a day. I have been following her blog for a while now and have also been thinking about doing the photo a day for a while too and this month actually stopped being lazy about it. Basically each month Chantelle (from Fat Mum Slim) posts a photo a day list. Each day there is a prompt for you to take a photo, for example in March the second prompt (the one for today) is "I made this!" so you take a photo of something you made. 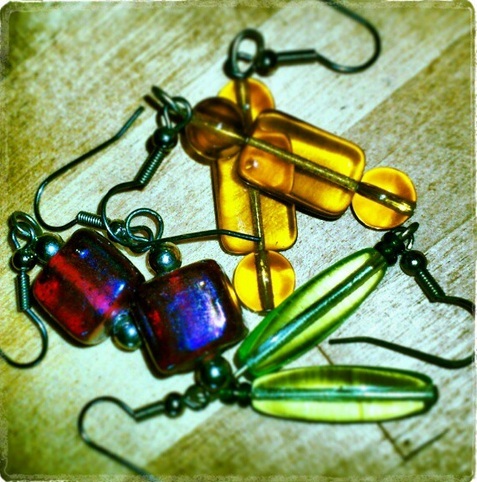 I took a photo of some of the earrings that I have made. Then you can share the photo on Facebook, Twitter, Instagram, your blog, Tumblr, or Flickr. I am taking my photos on my phone using Instagram and then I share them using the hashtag #FMSphotoaday. I also have them in the side bar of this blog as an Instagram feed. Do you do Fat Mum Slim's photo a day?